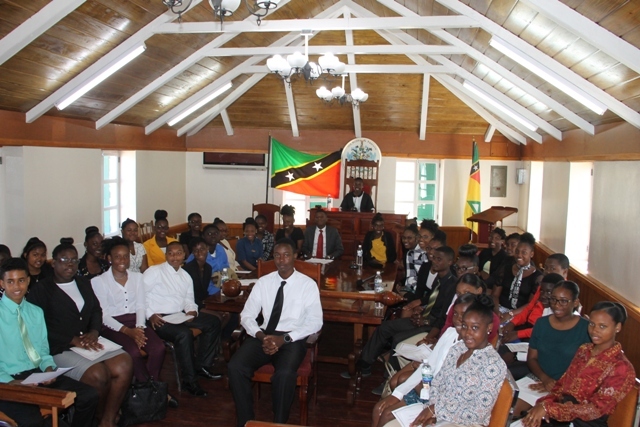 NIA CHARLESTOWN NEVIS (March 13, 2018) — Youth Parliamentarians drawn from secondary schools on Nevis commemorated Commonwealth Day with a mock opening session of a sitting of parliament at the Nevis Island Assembly chambers at Hamilton House on March 12, 2018. During the session, leadership roles were assumed by select individuals following an election amongst themselves on February 21, 2018. Ms. Ajuma Liburd was nominated and accepted as the President of the House, Mr. Patrice Nisbett led the 17-member Government team and Ms. Shian Tyson headed the 17-member Opposition team. During the sitting, members of the Assembly took their Oath of Allegiance, which was followed by the election of the President. 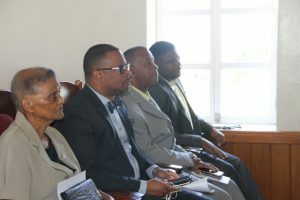 The sitting was suspended for the arrival of the Acting Deputy Governor General, Mr. Rol-J Williams. On resumption of the mock sitting, he presented the Throne Speech. At the end of the special sitting, Hon. Farrell Smithen, President of the Nevis Island Assembly thanked Acting Deputy Governor General Hon. Majorie Morton, former President of the Nevis Island Assembly; Hon. Mark Brantley, Premier of Nevis, Hon. Troy Liburd, Minister of Education; Hon. Eric Evelyn, Minister of Youth; Hon. 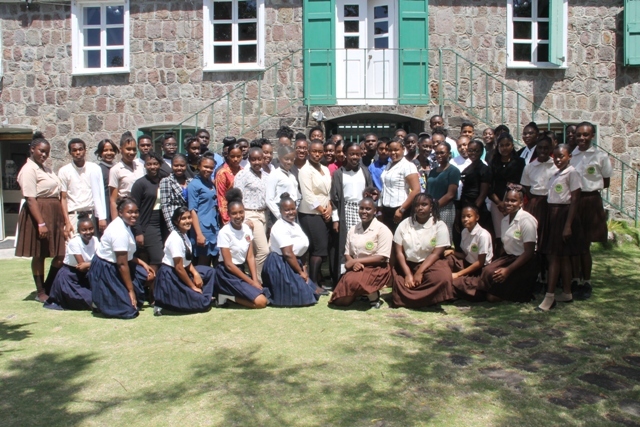 Hazel Brandy-Williams, and the students of the Gingerland Secondary School (GSS) and the Charlestown Secondary School (CSS) for their presence. He explained that the aim of the mock youth parliament is an activity to foster the youth’s involvement in the proceedings of parliament and to prepare them for regional debates and discussions. “What we set out to do was to get the youths involved and to participate and be part of the opening of a parliament. You would recall that we had our opening of parliament just over a month ago and I thought it was in keeping [with that sitting] that we should do similar,” he said. “Going forward, the youth parliament is slated to meet in the Cayman Islands, that is the regional parliament, later this year and what we’re going to be doing is that hopefully we would be sending a delegation [of four] there. 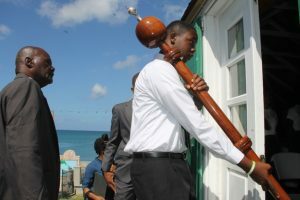 Over the years Nevis has performed credibly well at youth parliaments,” he said. To prepare the youth parliamentarians, the more seasoned members would assist the younger members to ensure longevity and continuity within the group. In 2014 the Youth Parliament debated “Capital Punishment”, presented and debated a budget in 2015, hosted a question section in 2016, and held a discussion on the Flamboyant Nursing Home in 2017. The parliamentarians were awarded with Certificates of Participation at the close of the sitting.